From Middle English bor, boor, from Old English bār, from Proto-Germanic *bairaz (whence also Dutch beer, obsolete dialectal German Bär (“boar”)), from Proto-Indo-European *bʰoidʰ-s-o (compare Lithuanian baĩsas (“terrible apparition”), Old Church Slavonic бѣсъ (běsŭ, “demon”)), enlargement of *bʰoidʰ-. More at bad. 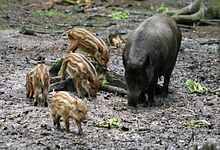 “boar” in The Nynorsk Dictionary. From Vulgar Latin, Late Latin bovārius or boārius (“cow herder”), from Latin bovārius, boārius (“of cattle”), from bōs. Equivalent to bou +‎ -ar. Compare Aromanian buyear, French bouvier, Italian boaro, Portuguese boieiro, Spanish boyero.